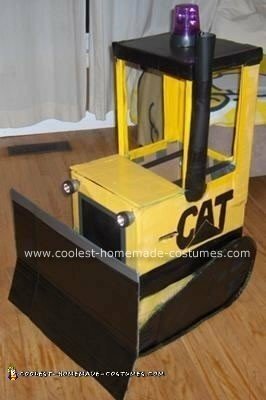 I made this Bulldozer Costume for my 3 year old son who loves construction. I made it out of diaper boxes, and duct tape. I used real working flashlights for the headlights and the cherry top light was a dollar store find! The tracks I made using nylon rope and just hot glued it to the cardboard tracks. I made a hood that opened for him to store his candy in. Since it was a bit front heavy I cut handles into the sides so he could hold it to walk. I used suspender type straps inside the cab to keep it in place. I went to a safety store and purchased a safety vest and hard hat for him to wear. Is there anyway you can post here step by step instructions? What a cute idea!! My 3 yr old LOVES track hoes and bulldozers. Can you please post here step by step instructions please?